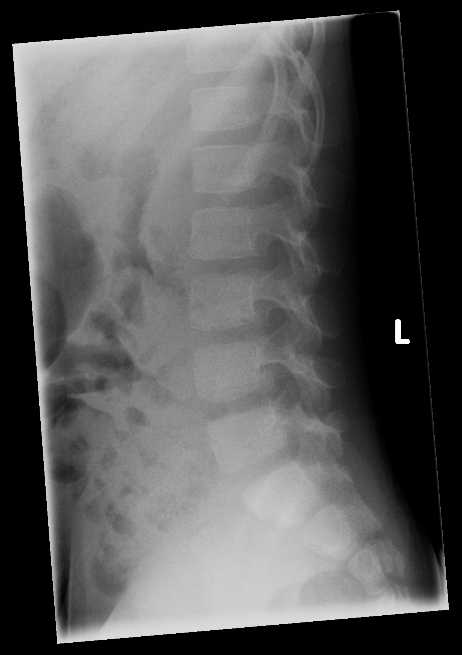 A 6 y/o male with PMHx of asthma presents to the ED with bilateral leg pain, back pain, and chills for one day. Per his mother, he awoke earlier in the morning complaining of pain and chills that was initially responsive to ibuprofen, but then recurred later that morning with a refusal to ambulate because of the pain. Of note, that patient was in a potato sack race the day before and had fallen onto both legs, but was ambulatory following his fall and was otherwise acting at his baseline yesterday. His mother notes that he has been having intermittent back pain for the last several weeks. He denies fevers, congestion, vomiting, diarrhea, bleeding, bruising, or tick exposures. On exam, the patient is well-appearing and interactive, and his musculoskeletal exam is notable for mild tenderness of the medial aspect of his right distal lower extremity without any deformities, joint swelling, or erythema. He also has para-spinal lumbar muscle tenderness, but no midline spinal tenderness. He has full strength of his lower extremities while laying down and symmetric sensation to light touch; however, when the patient is asked to ambulate, he avoids weight bearing on the right leg due to pain and a limping gait. Plain films are ordered that show a possible buckle fracture of his proximal 3rd metatarsal of the right foot, but the patient denies any point tenderness. Lumbar spine films are normal. Because his symptoms of chills and intermittent back pain did not seem consistent with a foot fracture, additional labs are ordered including CBC, inflammatory markers, and an LDH. While his workup is pending, the patient spikes a fever to 101.2F and cultures were added. Preliminary lab work is notable for a leukocytosis to 29.7, hemoglobin of 9.7, CRP 24, and ESR of 104. His LDH was significantly elevated to 2360. Given concern for possible malignancy, heme-onc is consulted, and a manual differential performed by pathology reveals 65% blasts concerning for acute lymphoblastic leukemia (ALL). The patient was started on cefepime for his fever and D5 fluids and admitted to heme-onc. Further inpatient testing confirms the diagnosis of pre-B cell ALL, and the patient is started on chemotherapy. On hospital day #24, he demonstrates good neutrophil recovery and was discharged home with close outpatient follow-up. ALL is a malignant disease of lymphoid precursor cells in the bone marrow, and is the most common malignancy among children, comprising 30% of pediatric cancers. Classically, lower back pain (LBP) in the pediatric population has been thought of as a “red flag” because its perceived low prevalence and earlier studies demonstrating a high rate of identifiable and often serious underlying pathology. (6) However, recent literature has challenged this notion, demonstrating that LBP in the pediatric population is of increasing prevalence, is mostly MSK in nature and self-limiting, and nearly 80% of patients have no specific underlying etiology despite advanced testing. (7-9) However, the differential for back pain in the pediatric population is broad, and infectious, inflammatory, and malignant etiologies should also be considered. For a review and algorithmic approach to back pain in pediatrics, check out this AAFP summary. These findings should prompt further workup including blood work, plain films, and advanced imaging as indicated. The most common findings on labs are anemia, thrombocytopenia, the presence of lymphoblasts, elevated inflammatory markers, and elevated LDH. However, initial blood work may be normal, so if clinical suspicion is high, further diagnostic testing may be warranted. What’s up with that Lactate Dehydrogenase elevation (LDH)? LDH is a cytoplasmic enzyme that exists in most tissues, and can be a marker of tissue damage, hemolysis, or high cell turnover. In our case, the patient was noted to have a significantly elevated LDH, but no clear evidence of hemolysis on his lab work. In a study of adult inpatients looking at LDH as a distinguishing biomarker, patients with significantly elevated LDH >800 IU/ml were strongly associated with the presence of underlying cancer, metastases, and infection. (12) So the next time you see a significantly elevated LDH, consider underlying malignant or infectious disease. ALL is the most common malignancy of children. Typical features are fevers, fatigue, pallor, bleeding or bruising. MSK pain can be a common presenting complaint in ALL making it difficult to diagnose. Back pain is actually more common in pediatrics than previously thought and often benign unless associated with red-flag symptoms. Obtain blood work including CBC, inflammatory markers, LDH, and plain films if suspicion for serious underlying pathology is high. Significantly elevated LDH may be a marker of malignancy or infection. Faculty Reviewer: Jane Preotle, M.D. 1 Zombori L, Kovacs G, Csoka M, et al. Rheumatic symptoms in childhood leukaemia and lymphoma—a ten year retrospective study. Pediatr Rheumatol. 2013;11:20. 2 Sinigaglia R, Gigante C, Bisinella G, et al. Musculoskeletal manifestations in pediatric acute leukemia. J Pediatr Orthop. 2008;28(1):20-8. 3 Kobayashi D, Satsuma S, Kamegaya M, et al. Musculoskeletal conditions of acute leukemia and malignant lymphoma in children. J Pediatr Orthop. 2005;14:156-161. 4 Cabral DA, Tucker LB. Malignancies in children who initially presents with rheumatic complaints. J Pediatr. 1999;134(1):53-7. 5 Kang S, Im HJ, Bae K, et al. Infuence of muscuoskeletal manifestations as the only presenting symptoms in B-cell Acute Lymphoblastic Leukemia. J Pediatr. 2017;182:290-295. 6 Turner PG, Hancock PG, Green JH, et al. Back pain in childhood. Spine. 1989;14:812-14. 7 MacDonald J, Stuart E, Rodenberg R. Musculoskeletal low back pain in school-aged children: A review. JAMA Pediatr. 2017;171(3):280-287. 8 Bhatia NN, Chow G, Timon SJ, et al. Diagnostic modalities for the evaluation of pediatric back pain: a prospective study. J Pediatr Orthop. 2008;28(2):230-3. 9 Yang S, Werner BC, Singla A, Abel MF. Low back pain in adolescents: a 1-year analysis of eventual diagnosis. J Pediatr Orthop. 2017;37(5):344-47. 10 Massoud M, Del Bufalo F, Caterina Musolino AM, et al. Myeloid sarcoma presenting as low back pain in the pediatric emergency department. J Emerg Med. 2016;51(3):308-14. 11 Feldman DS, Straight JJ, Badra MI, et al. Evaluation of an algorithmic approach to pediatric back pain. J Pedaitr Orthop. 2006;26:353-8. 12 Erez A, Shental O, Tchebiner JZ, et al. Diagnostic and prognostic value or very high serum lactate dehydrogenase in admitted medical patients. Isr Med Assoc J. 2014;16(7):439-43. Newer PostPediatric Cough: Just Another Virus?